No UK launch confirmed for Google Chromecast streaming device... yet | What Hi-Fi? UK consumers are set to be among the first outside the US to get their hands on the Google Chromecast – the HDMI dongle that streams audio and video content to your high-definition TV. But any suggestion it's going to be as early as next month appear wide of the mark. It is widely believed that there are plans to make the digital media adapter available on this side of the Atlantic, but a Google spokesperson told us – after reports pointed towards a possible 1 March release – that an official UK launch date had not yet been finalised. While an official UK release has yet to be confirmed by Google, you can get your hands on a Chromecast through Amazon.co.uk for £49.95 or direct from the US. If you do buy a US version you will get access to Google Play movies, Netflix and YouTube but you won't get UK catch-up services such as BBC iPlayer. Launched in summer 2013, Google Chromecast is available in the US right now for $35. The 2.83in, HDMI dongle lets you directly stream content via wi-fi from the internet or a local network using a range of enabled mobile and web apps. Google Chromecast has HDMI and CEC-compatible outputs and a maximum video resolution of 1080p. It supports a variety of operating systems including iOS 6+, Android 2.3+ and Windows 7+. Power comes by way of its USB connection, although a power adapter is included. Services that are already included on the Chromecast platform include Netflix; YouTube; Hulu Plus; and Google Play Movies and Music. 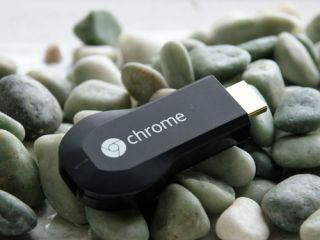 The device also offers "tab casting" – a feature that lets you view tabs in the Google Chrome browser on your HDTV. But if that isn't enough for you, there may be a huge influx of new apps coming to Chromecast soon. That's because the Google Cast Software Development Kit (SDK) has been released. If you're a developer, you can now build Chromecast support into your apps/websites. It is still early days yet as to what we can expect as the SDK only became available at the beginning of this month, but there's already been talk that Beats Music and Rdio are looking to join the party. Spotify, on the other hand, has no immediate plans to get involved. Google says of the SDK: "We want to make it easier for that content to get to your TV, so today we’re releasing the SDK for developers who want to build Chromecast support into their apps and websites. "For the rest of us, that means even more of our favourite movies, TV shows and music will become available on Chromecast as developers work with the SDK." In addition, Synology has added support for the platform to its network-attached drives after unveiling its latest DiskStation Manager operating system, DSM 5.0. It means you can now stream photos to Apple TV and Chromecast with any mobile device from DS Photo+.